2. b. transf. A violent downpour or rush of water. Except during spilling and a release. 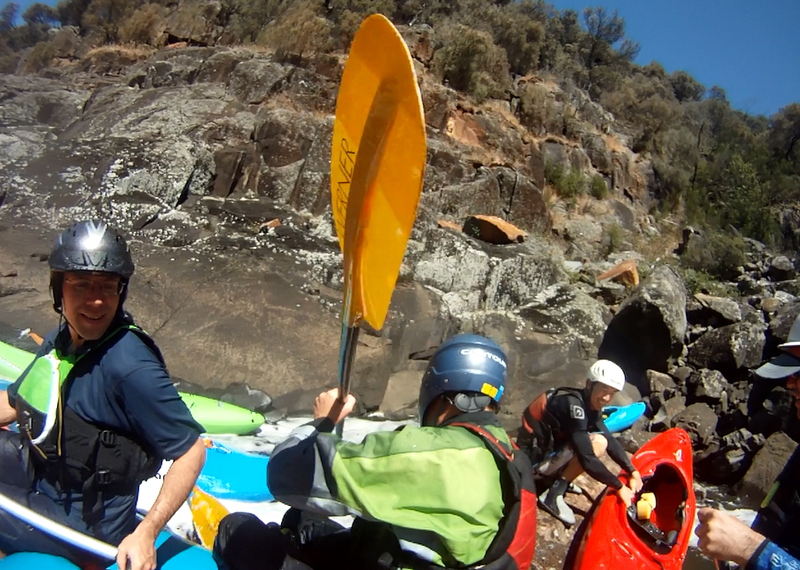 Then, the gorge becomes a Mecca for kayakers and rafters around the island and beyond, and they descend the 5kms from the dam to the Tamar with varying degrees of ability and grace. Since I was down in Tasmania anyway (ostensibly for an academic conference, but extended into a nearly three week holiday of beaches and climbing), I joined up with the Tasmanian University Rafters. I’d paddled with them when I lived in Tasmania, and had also rafted with them down the Upper Ouse River the previous day. 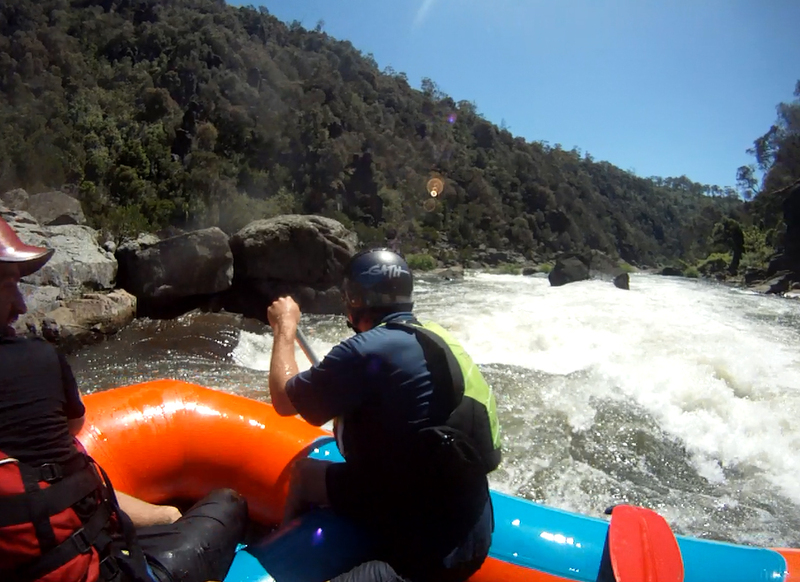 The Ouse had been a bit of a disappointment, as Hydro Tasmania had predicted a release of 22 cumecs, and then someone had decided to release only 8, turning the glorious Grade 3 Central Highlands trip into a rather bony one. 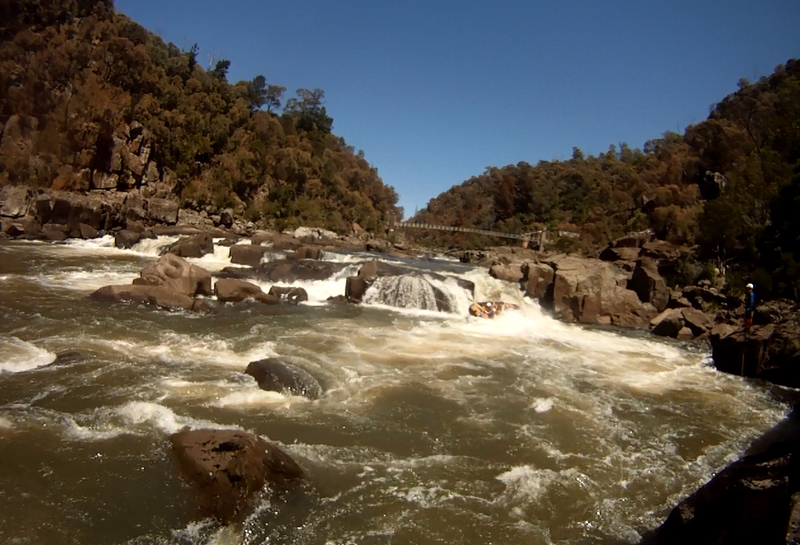 Still, it wasn’t often that I had a chance to raft Cataract Gorge, and we had a strong team of experienced guides, so we headed off for Hydro’s promised northern release. After the seeming compulsory stopover in Campbell Town* we arrived at the Trevallyn Dam get-in, and dragged our rafts and pumps down the little goat-track to the water. We’d decided to take two of the club’s delightfully gaudy polyurethane Sotars, as we weren’t sure how high a 25 cumec release through the Gorge would be and wanted these smaller (10 foot) boats just in case. 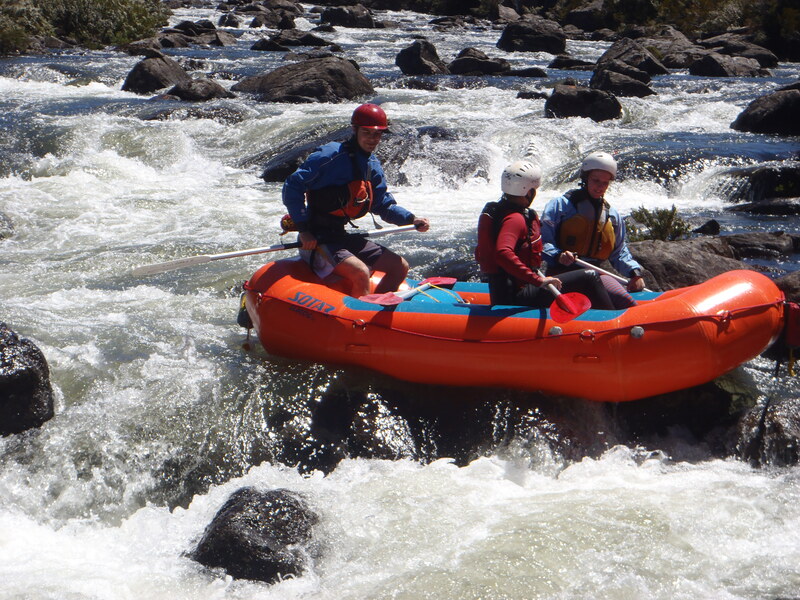 We were joined by a commercial rafter known to a few in the club, who was using his own ancient and fantastically repaired raft to take a few of his friends down the release. With faff as limited as we could make it, we prepared ourselves and our equipment, and then pushed off. 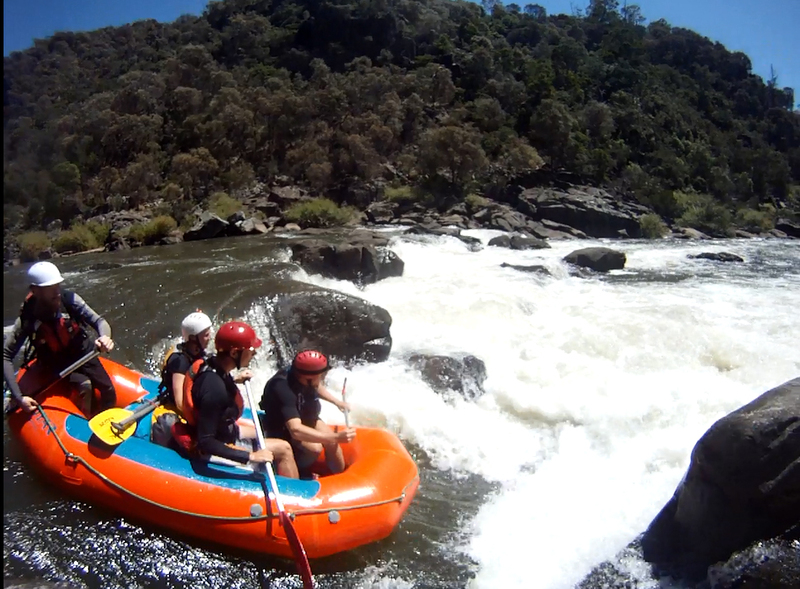 In Tasmania, this is probably one of the most renowned white water runs, and I’d been hearing stories about it for years before this trip. 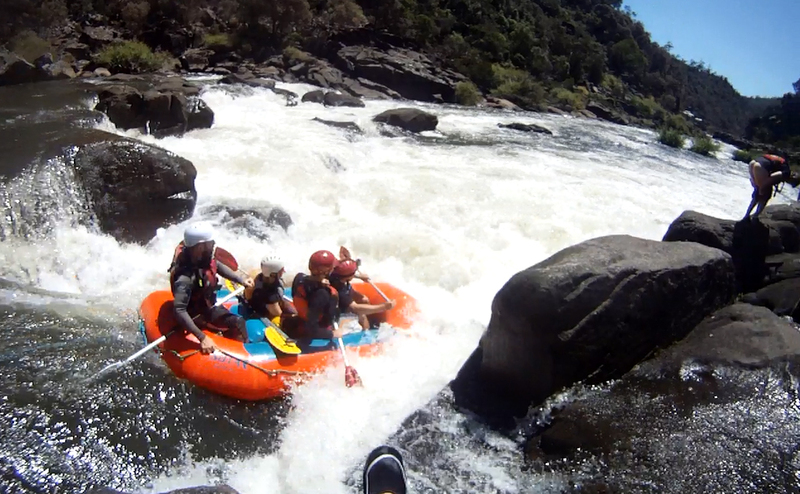 In our raft, only our guide had ever been down the river before, and there was a lot of expectation about what the flood-gates of heaven would turn out to be like when they were released. We opened with flat water paddling, which quickly evolved into Grade 2, and built into Grade 3 and 4 once we’d portaged over the weir. (We were bemused by the commercial guide taking his raft straight over the weir as the kayakers were doing, and getting stuck for a time on top of it.) We picked up a stranded kayaker and ferried him to his eddy-bound kayak, though we were less sure of what to do with two absolutely adorable Black Duck ducklings, besides hope that their mother would find them again. 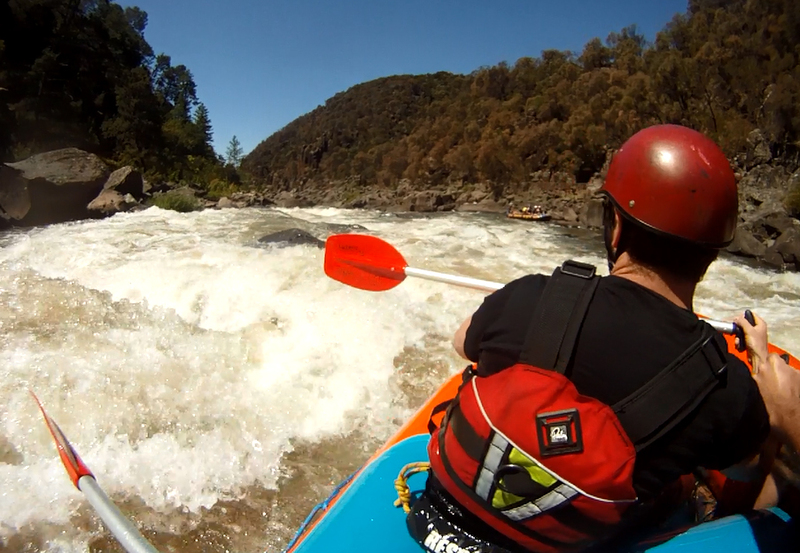 By this point, one of our crew had nearly fallen out, and was already quite astonished by the size of the white water. He was assured that there was much more to come. Pushing onwards, we were definitely getting into Grade 4 territory. The small boats and their 4 person crews sat high in the water, and high-siding and constant paddling momentum was needed to keep them level through the rough sections. 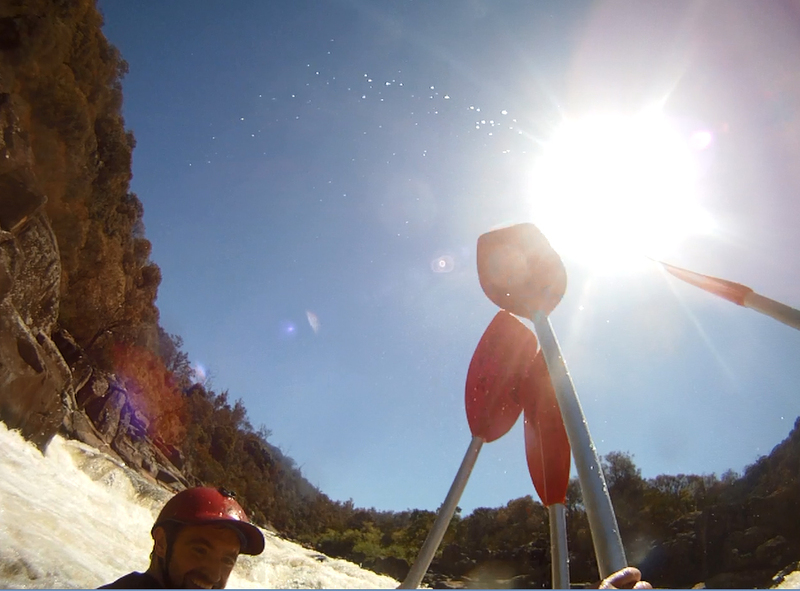 Still, it was a superbly warm and sunny day, and the TUWWRC can always keep themselves entertained. Eventually we reached the rather ominously named “Arse-Raper” and decided to portage around, as although some of the crew had paddled it before we wanted to play it safe with the moderate water and small boats. 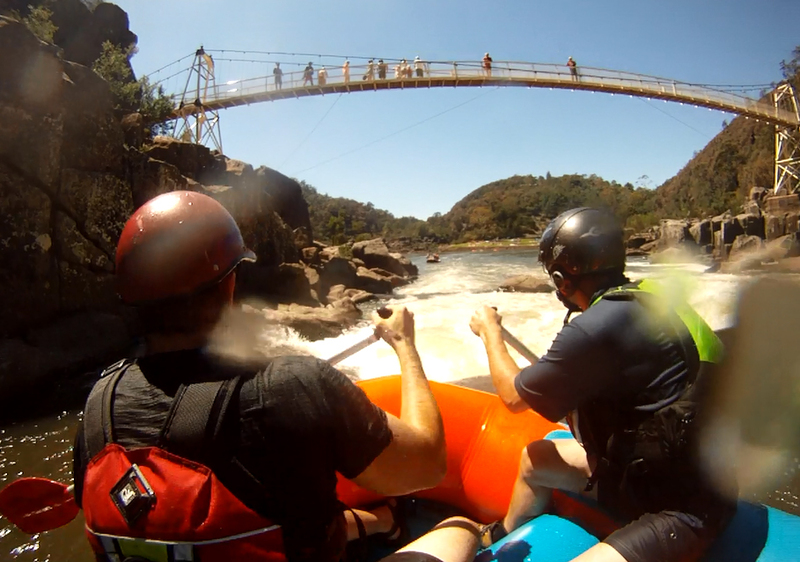 As we carried and lined the boats around the rapid we watched the antics of our fellow release paddlers, admiring the boldness of the commercial guide for pushing through the Arse-Raper, and the grace of the kayakers as they glided through it. One kayaker’s spray skirt loosened, and he paddled even whilst sinking until he was saved by a throw bag. We reached the Duck Reach Power Station (now a museum), enjoying the nice cascade upstream, and a bouldery slot downstream of the swing bridge there. Finally we reached the island, where even the commercial guide and his friends decided to portage. The left side is a steep and continuous rock garden, too low to raft, and the right side has two 2 metre drops (The Toaster and Sandwich Press) as well as other big features (Mixmaster and Cheesegrater). Even portaging over the island wasn’t without its hazards, with one raft swinging into a tree as it was lined down, and one guide nearly disappearing into a rapid underneath a willow. Nevertheless, we reached the end of the island unscathed, and paddled onwards. One of our rafts finally gave into the inevitable and flipped, though at least the commercial guide and his friends managed to rescue two of their paddles. This same raft also had a constant struggle with the slippery new stern line constantly unravelling itself, and this was snagged several times before it eventually caught, held and had to be cut. Yet otherwise we shot through to the First Basin unharmed. First Basin was quite a contrast to our experiences upstream – here were relaxing tourists and locals, clad in almost nothing and lounging on the warm rocks or by the pool. 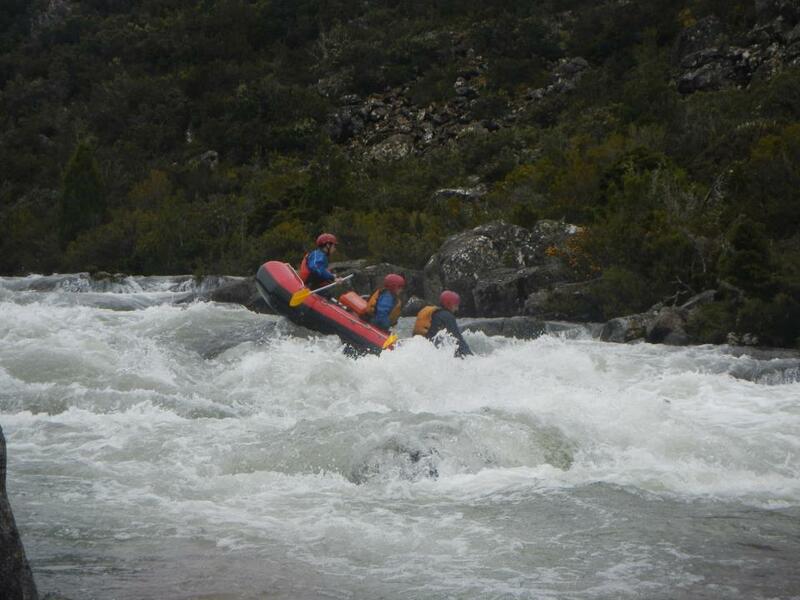 We too relaxed in our rafts for a moment, some people rushing down some nibbles, and then pushed down through the Slalom rapids to the get-out on the jetty of the tidal Tamar River. And then we were done. 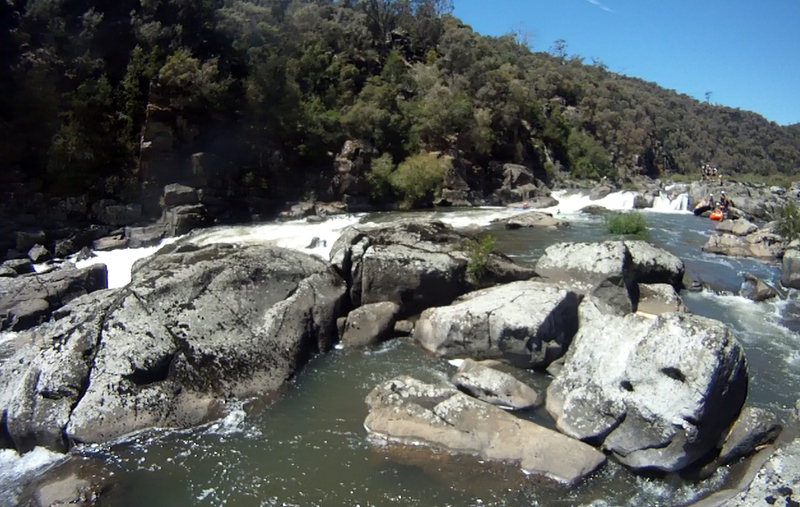 We’d survived the infamous Cataract Gorge. It was a spectacular 30 degree day, and we relaxed in the shade with some ice cold beers, chatting and gossiping about nothing in particular, and lazily rolling up the soon-dry rafts. The flood-gates of heaven had been opened, and it had turned out to be aptly named after all. *Tasmanians are seemingly unable to travel between the southern and northern cities without stopping in Campbell Town for food en route. The opening definition is, unsurprisingly, lifted from that most wonderful of references, the Oxford English Dictionary. Description and a video from Adventure Pro. The only lengthy on-line description of the run that I could find (more suggestions welcome! ).